During the Tomb-sweeping (Qingming) Festival weekend lasting from April 4 through 7, 2019, the Taipei City Police Department (TCPD) expects that all across Taipei, bus stops, train stations, transfer hubs, sightseeing and scenic spots, major department stores, and other sales venues will gradually experience large crowds of shoppers, holiday makers, and people returning home to their family outside Taipei starting from the afternoon of Wednesday, April 3. Therefore, the Police Department will implement traffic guidance at 98 major intersections such as Zhongshan North Road with Zhongxiao West Road starting from 16:00 on April 3, and from 16:30 onward on other intersections as well. The public is reminded to follow the traffic police’s directions. The Freeway Bureau will implement high-traffic load controls along National Freeway No. 1 (southbound) on Wednesday, April 4, from 07:00-12:00. In Taipei City, these control points will include eight locations: Chongqing North Road Interchange Exit (southbound), Minzu East Road Songjiang Road Exit, Binjiang Street (Dajia Elementary School) Highway Exit (southbound), Jianguo Elevated Road (northbound toward Jianguo Elevated Road, before Minquan East Road Exit) Huanhe North Road Exit (southbound), Chenggong Road Section 2 Interchange Exit (southbound), Xizhi-Wugu Elevated Highway Gangqian Road Exit at Tiding Boulevard (southbound), and Xizhi-Wugu Elevated Highway Jiuzong Road Section 2 Exit (southbound). TCPD will implement traffic control and rerouting measures to maintain smooth traffic flows for the public. Citizens should pay extra attention to road safety for themselves and others at these times and places. I. Traffic control period：April 4-7, 2019, 05：30-17：00 daily. 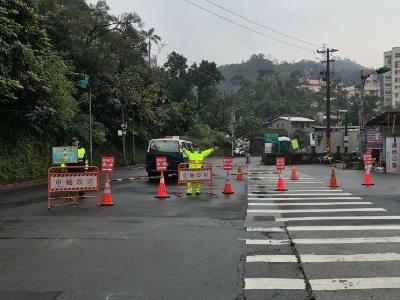 (b)	Yangmingshan First Cemetery Control Point：Xingyi Road and Quanyuan Road (Tun Hsu Vocational Senior High School, entrance toward cemetery access road) in Beitou District.